John Savage- Experience on the Black Prince Sternwheeler as a young man. "The Experiences of an Itinerant Sign Painter"
One might think looking at the youth of John Wesley Savage that he should have died an early and glorious death; I'm not just talking about his participation in major battle campaigns of WWI. The mortality rate of an artillery machine gunner during the war was extremely high, and then his subsequent wound at Audenarde, Belgium toward the end of the war. John seemed to endure and survive it all with humor and grace. Like his cousin John Boyd who also served in WWI, John Savage was the youngest male of 11 children born to George and Georgetta Savage in Birdsview 27 October 1889 according to his birth certificate. In an interview with Ted & Betty Savage in 2001,Ted told me that his father John liked to relate his earliest memory of being stepped on in a canoe during what looked to be one of the very few Indian uprisings in the area. Historically it may have turned out to be nothing. Apparently a dog owned by one of the local natives killed some sheep of a local settler. The farmer in turn went out to find the animal, found the dog responsible and killed it. This did not go over well with the tribe who got pretty worked up about it. Most of the settlers in the Birdsview area on hearing the natives might go on the warpath started to panic; grabbed the few supplies they needed along with the children to load in a canoe to go down river to someplace not so hostile. Nothing came of it as once told the army was on their way up to settle the dispute, the tribe usually settled down as they had in the past. Johns misadventure did not end here as a baby though! According to his son Ted, sometime during his teens John decided to go out deer hunting on his own, which folks in modern times might look at in disbelief, but was not unusual at the turn of the 20th century. Four to five miles out from home while climbing over a fallen tree, his rifle had fallen from where he had leaned it and shot off a round. Unfortunately- or fortunately for that matter- for John, the bullet passed went clean through his body. Not hitting a vital organ and after recovering his senses, he packed snow into the wound and headed for home, repacking more snow as needed. When his father George Savage finally got John to a doctor, he was told not to expect John to live. I will now turn the story over to the famous Kate Savage, Johns younger sister by 2 ½ years, who years ago told this story as a ballad called "The Winter Deer Hunt" from her collection of Pioneer Day Poems. When winter came, the hills were white and that meant, "tracking" snow. And brother said to me one night, "I think to hunt I'll go." We had no ammunition, so we went down to the mill. "We'll find some lead," my brother said, "And then some shells we'll fill." Our search brought on Babbitt. We never did find lead. Said he, "I know this stuff will melt. We'll just use it instead." We took it home and "het" the spoon. We poured it in the molds. 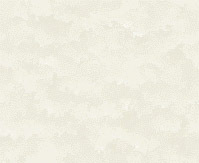 The blanks were powdered very soon. The caps shoved in the holes. John grabbed the old gun from the wall and boasted, "Here I go!" He looked so very grand and tall while striding through the snow. And bleeding in the snow he lay, a sad end to his fun. He weakly staggered home at last. Pa got him to a boat. Then tried to row so very fast amid drift ice afloat. Pa aimed to reach the nearest town to get a doctor's care. He raced the Skagit River down with his helpless burden there. It was no use. The darkness fell and brother dying lay. Pa was mighty tired as well with town still far away. Then on the riverbank he saw a tiny twinkling light. It pierced the fog, now cold and raw, a beacon in the night. The farmer took a horse and sped to get the doctor quick. And still alive but badly spent my brother lay so sick. The doctor came and all was well. No lead poisoning was there. That alloy bullet, sharp and clean, had saved him by a hair. Said Pa, "Since you two had to snoop, I'm glad you found hard metal. Had it been lead, he would be dead. But now he's in fine fettle." Sighed brother as in bed he lay, "I want to get my deer. Though I'm no hunter as you say. I'll try my luck next year." "When homeward he returned at length, he loved each far-off trail. The outdoor life renewed his strength and John was strong and hale." The near tragedy did not seem to detour him from an outdoor life or the adventures he seemed to enjoy. As the United States entered the World War, John signed on out of Mt. Vernon, Washington 27 April 1918. Sent straight into major engagements after training as a machine gunner at Camp Lewis, Washington. John fought at St. Mihiel, Meuse-Argonne, Lys-Ypres, and finally Audenarde, Belgium. While taking a message in Audenarde, John was hit in the leg by shell fragments and according to Ted Savage; John walked or crawled to a barn where others were wounded as well. As the Americans were transporting the wounded out, Johns leg wound was found to be the less serious and was told to hang tight until they could return for him. The problem turned out to be that John seemed to have been forgotten. By the second to third day though, the English found him unconscious and with no dog tags. They took him to an English hospital and with the leg close to having gangrene setting in; they gave him a choice of amputation-, which the Americans would have done automatically- or using some new solution on the leg. Johns reply to the physician was "Hell no, you're not going to cut my leg off." John apparently was declared M.I.A. 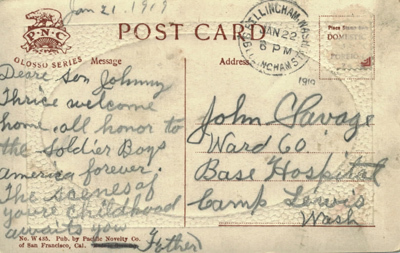 for sometime, but eventually found and sent to heal from his wound at Camp Lewis, where his father George Savage sent him post cards calling him home. John was mustered out of the service 27 March 1919. 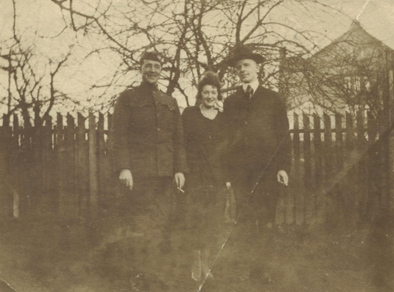 His nephews, George and Warren Savage who were sons of his brother Leslie Savage also served in the War. It's said by some that surviving a war really has more to do with luck and timing than skill, knowledge, or even base human survival instinct. But it does appear John lived a charmed life to survive his youth. The following obituary and article from the Charmed Land Magazine cover the rest of John's life pretty well and doesn't need repeated here. Funeral services fro John W. Savage, 84, of 1911 N.W. Sloop Pl., a World War I veteran and painter, will be at 3:00 p.m. Tomorrow at Wiggen & Sons. Burial will be in Acacia. He died Monday. A native of Birdsview, Skagit Co., Mr. Savage painted logging activities on the Skagit River as he remembered them from the 1870's. The paintings were published in The Times Charmed Land Magazine. 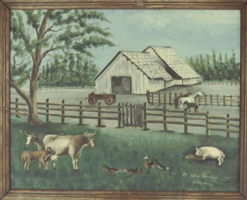 The Washington State Historical Society purchased the originals. 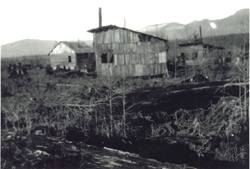 Mr. Savage was a house painter as a youth when he lived in Hamilton, on the Skagit River. He later began sign painting. He painted an eight-story-high sign on the upper portion of the Roosevelt Hotel. 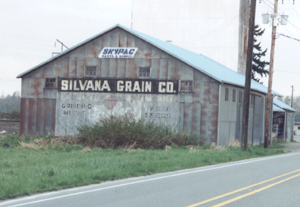 Mr. Savage and C. E. Stevens painted signs in this state, Idaho, North Dakota and Montana. In one year they painted 1,800 Fisher's flour signs. Mr. Savage retired from sign painting in 1937. Mr. Savage worked for the Navy in Bremerton until 1941 when he retired again. He was a member of the Military Order of the Purple Heart, the Disabled American Veterans of Foreign Wars and the 91st Infantry Division. He was a charter member of the Salmon Bay Aerie No. 2141, Eagles, and an honorary member of the Washington State Historical Society. Surviving are two sons, Theodore, Seattle, and Dr. Bob Savage, Langley, Whidbey Island, and two sisters, Mrs. Rose Brobock, Anacortes, and Mrs. Catherine Pulsipher, Birdsview. Since John Savage's paintings of logging on the Skagit River in the 1870's were published last year in The Charmed Land Magazine, the Washington State Historical Society has purchased the originals and two others of the same period. Until he made the pictures from memory, Savage, who resides at 1911 N.W. Sloop Place, never had painted landscaped except those he copied. He has wielded a paintbrush since boyhood, but his easel most of the time was the side of a building. The art he produced generally consisted in about 600 square feet of lettered advertising on the virtues of flour, baking powder, soft drinks or similar commodities. Savage belonged to that hardy breed, the itinerant sign painter. His craft has become obsolete since billboard laws, license fees and unions discourage any migrant with a brush. Savage quit the road in 1937 and was among the last of his kind on the Pacific Coast. 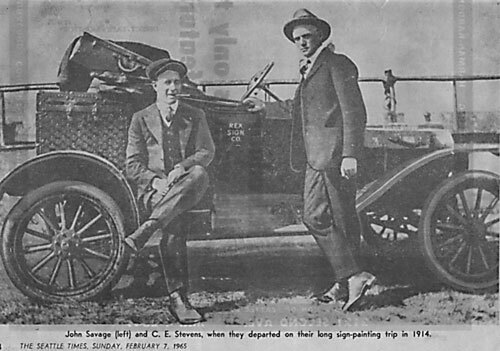 His teammate, the late C. E. Stevens, organized a billboard advertising company, but Savage stuck to his old trade, preferring big spaces and the adventure of moving around. The tallest sign he painted was eight stories high on the upper portion of the Roosevelt Hotel wall, to advertise that hostelry. Customarily he painted commercial slogans such as "Look for the miner," to go with a man on his knees frying flapjacks made with a well-known flour, and "Raises the dome," to accompany an enormous baking-powder can. The funniest he ever did was for a Bellingham dentist: "Ha, ha, ha, it didn't hurt a bit." Then there was the sign on a pharmacy in another Washington town: "It's a pleasure to die after taking our medicine." Signs on buildings were paid for by the square foot. The larger they were, the more the painting contractor received. Usually, he set out on the road with an agreement from a manufacturer to paint so many signs about its products in so many months. Instead of renting wall space on a store, the painter would paint the owner's sign in return for placing a large one about a certain article on the side of the building. In the country it was the custom to place a box of groceries on a table and proposition a farmer they were his, plus a durable coat of paint on his barn, if he would consent to having a sign on the roof of the structure or across it side. "Anything to keep from paying real money," Savage reminisced. This kind of art was extremely repetitious. In one year Steven and Savage painted 1,800 Fisher's flour sign. The first season on the road was a good initiation. Part of a mill contract called for painting 96 signs across the tops of grain elevators. The metal was so hot to paint in summer it almost burned the men's fingers. In winter they worked in snow so deep they could not drive the car. Savage said: " I started as a house painter when I was a kid in Hamilton up on the Skagit. I didn't know anything about sign painting, but I was always fussing with chalk and pencil. My boss, a man named Gable, wanted to know why I didn't paint signs when people asked me to. I told him didn't know how. Right after that I saw an ad in a Seattle paper for an apprentice in a sign shop, so I caught the train and applied for it. I stayed six months. "The fellows were so drunk in that shop I left and went to Beam Electric Sign Co. and worked for two years. They gave me the keys so I could sweep out. After a while another kid and I took to going in nights and practicing lettering and drawing on big rolls of paper laid on the counter. We taught ourselves; we never had a chance to go to school and learn anything about art. "I was 18 or 19 when the company took a job to paint a sign on the Armour & Co. warehouse near the depot. Beam hired Stevens, who was a wall man, and sent me to help him. "The sign was 100 feet long and 30 to 40 feet high and the building may have been six stories, I don't remember, Stevens supposed he had been given a real wall man as a helper. He got mad and called me dumb and nearly had a fight on the stage. "When he found I'd had no experience in the air but had him anyhow, he took a notion to me. Later I was employed in Mt. Vernon when he propositioned me to go along and sell 'snap jobs' to carry the painting contract he had. I rehearsed a sales talk that worked so well Stevens had to tell me to lay off; he was getting more jobs than he could handle. "Next he took me with him on an 18 months contract starting in July, 1914. We painted nothing but repetitions of a sign for the Royal Mill Co. of Great Falls, Mont. Sometimes we covered the whole side of a building with it. We drove as far east as Minot, N.D., through Idaho, Montana and Eastern Washington, traveling in a Ford car with a steamer trunk on the back containing our painting supplies. We tied our suitcases on top of it, put a ladder on one side and a small box of groceries on the other. Sometimes we were a long way from towns, so we carried a fly tent and were prepared to cook if we had to. "We got into Yellowstone Park and had put up our tent when a ranger warned us about bears. We thought he was kidding us. We went over to the hotel and when we came back we had to chase two big bears. We went to bed, after building a fire close to the tent, and thought it would keep them away. Steve was nervous and looked out after a while and there were those bears between the fire and us. We dashed out of there to the hotel and when we saw our camp again the bears had torn the trunk off the car, wrecked the tent, dragged a blanket into the woods and strewn everything around." Another time the car was stolen at Missoula and the painter forgot to notify the when they found it. They drove 40 miles into Superior only to be arrested for riding in their own missing vehicle. It took three hours of long-distance calls to clear them. Between Shelby and Choteau the car ran out of oil one night. Savage, left to guard it while Stevens got a lift to town, nearly froze in below-zero temperatures and had to break into a boarded-up homestead shack to save himself. Stevens's car had no windshield wiper or side curtains. In a snow storm out of Conrad the men tied a handkerchief to a stick and reached around to swab the windshield from time to time. Before long they looked like a pair of Santa Clauses. The car finally stuck in the snow and had to be pulled out by a team. The sign painters waited in Conrad a week for the weather to improve. Savage made the acquaintance of his wife [Nellie Wallace] when he was painting in Spokane. On a wintry morning a girl in a white apron hurried past him on the street as he was headed for a restaurant. Concluding that she must be a waitress, he followed her half a block and into the Golden West Café. He was so smitten that he proposed before leaving town. She accepted and joined him in Chehalis, where they were married. Savage had one sign, 10 by 20 feet, to complete before the crew would leave town next day. Most towns by then required a license fee of $50 to $100. to paint an advertising sign, but Stevens could not afford such charges, so his crew simply ignored the requirement. The sign almost was finished when a voice hailed them, "You all got a license to paint here? If not I'm taking all you'uns to jail." The speaker was a frowzy-headed fellow wearing a large badge. "I told Steve to finish the sign and then go to the hotel and get our wives suitcases and load the car." Savage explained. "I would go with this officer and stall for an hour or more to give Steve time to finish and load the car. I trotted up the street with the law man and asked to see the prosecuting attorney, which we did. Then I wanted to see the ordinance in regard to licenses. No one know where it was,, but after a long hunt, it was found. In reading it I saw a clause saying a sign could be painted for local business. So I said we were painting for the stores that handled the flour. The officers told me if the name of the store was on the signs it would be all right, so I said I would go and paint it on each one. "Now this I had no intention of doing, but the fellow with the badge was told to go along with me and see that I did. We started down the street in the direction of the car. "Meanwhile, Steve had gone to the hotel and my wife wanted to know where I was. Steve said, "The cops came and got him and took him to jail." "Now this was not good news for a bride and she was in a frenzy and wondered if she had married a gangster. Steve coaxed her to the car and they were waiting for me. I could see them down the street about two blocks away and wondered what I could do to ditch the law man. "Luck was with me, as a farmer came by and hollered, "Hey, Jim, I want to see you a moment." That was my chance. While the deputy stopped I just walked a little faster. Steve held the car door open and in I stepped. We didn't stop till we hit Aberdeen. The last I saw of my friend the law, he was standing in the street gaping." Savage had scores of adventures during his gypsyish sign-painting career. He worked in shops in winters and took to the road each spring, painting from Canada to the California boundaries and east into the Rocky Mountains. He like the rugged outdoor work and having to use his wits. "Sometimes a tenant gave us permission to paint a sign on a building and the owner didn't want it," he recalled. "Once in Spokane we had to paint a whole sign out and out a whole new coat of paint on a brick building to satisfy an owner and avoid a lawsuit. "Now," he said, "it's all over. You can't get the walls any more." 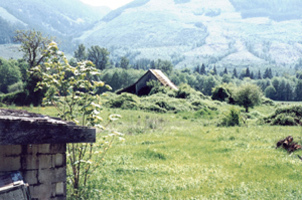 and acknowledgments Please e-mail us to say "Hi" so we can put you on an e-mail list for up-dates, if you're a Boyd or Savage descendant, a pioneer family from the Birdsview community & Skagit Co. We want to talk to anyone who loves the area and local history. Thanks!